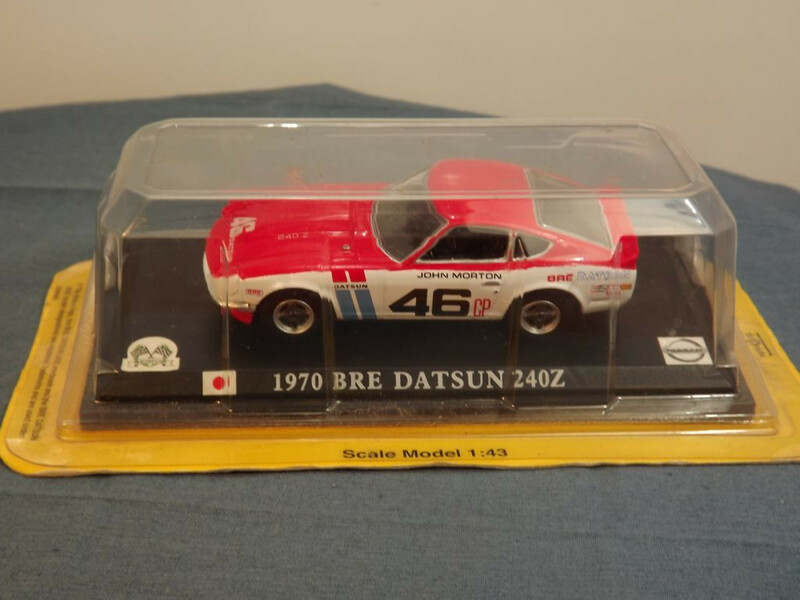 This model is the DelPrado BRE Datsun 240z (1970) in red and white with racing number 46. The casting is a Chinese casting but gives no indication of the origin of the die although the base is marked DelPrado Collection. It is assumed to be from a part-works was issued in a clear plastic display package, mounted on a black plastic display base. 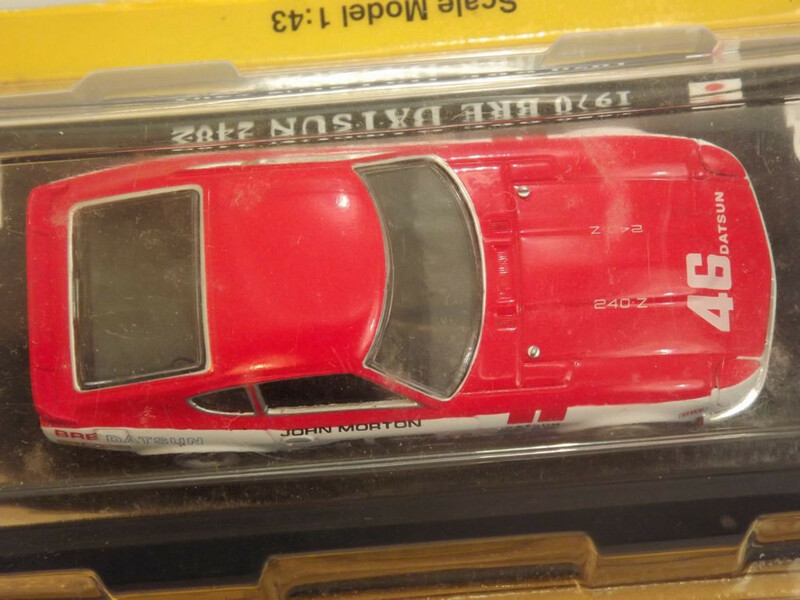 There are no opening parts on this model. All features are either cast into the metal or comprise photo-etched parts which are attached during the finishing of the model. 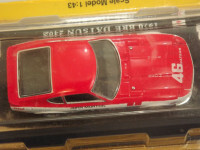 The model has separate front bumper and bonnet pins only. The front lights may be clear lenses inset into the body casting and over-painted red and white, the grille is painted black. The rear lights are red, orange and clear lenses set into the rear body, either side of a white number plate reading "BRE" in red. 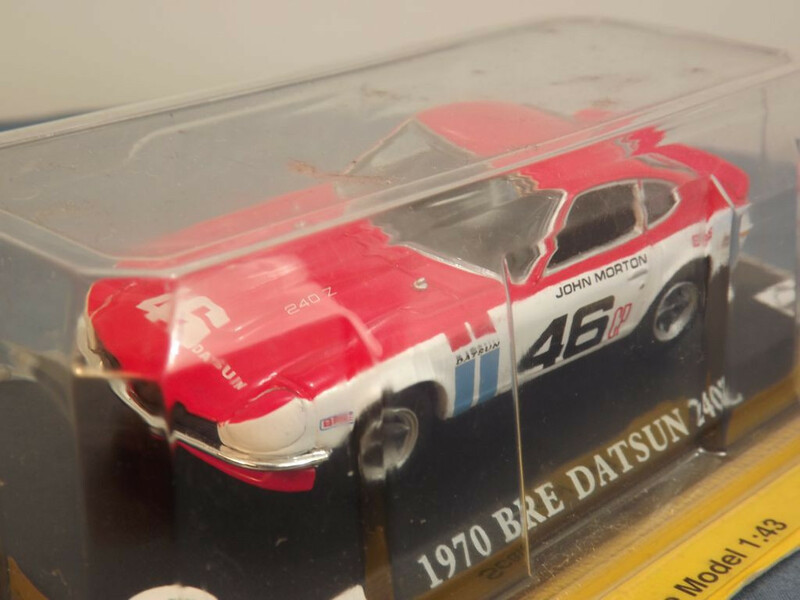 The entire body is covered with various racing decals (possibly tampo printed) — a white "46 datsun" across the front bonnet with white 240z at right angles further back on the bonnet, black "46" with red "CP" on each side door above which is "John Morton", and various "BRE Datsun" and "Datsun" decals on the sides and rear of the model. The interior is entirely black plastic and it has a black plastic, left hand drive steering wheel, dashboard, and gear stick. The steering wheel is mounted in a detailed dashboard (instrument panel). The glazing is clear plastic. All wheels appear to be one piece, plastic hubs in the fashion of a 4 spoked racing hub of the era with separate black "rubber" tyres. 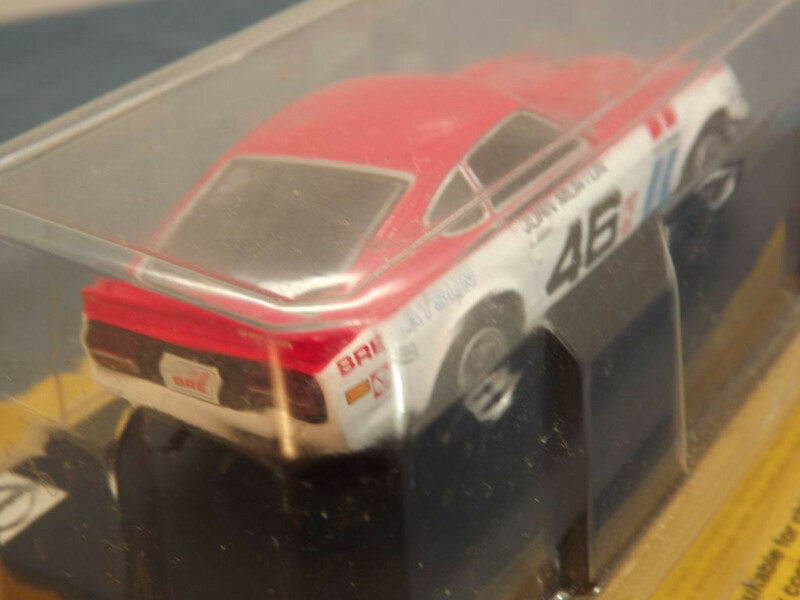 The base plate is black painted metal with © delPrado Collection on two lines at the top centre, a white tamp printed "Made in China" in the centre below the simulated drive shaft, and "1/43 1970 BRE Datsun 240Z" at the centre bottom. It also carries a rudimentary representation of the front and rear suspension, gearbox, drive shaft, rear differential, chassis, and exhaust system. It is held in place by 2 machined rivets. Issue date is unknown but was before 2010 and the scale is said to be 1/43.